Welcome to our Customer Services Centre! Here you'll find an array of information, tips and advice to ensure you have the safest possible experience when using Vivastreet. "Hello" from your local Customer Services Team! Vivastreet has teamed up with Action Fraud, the UK's national fraud and internet crime reporting centre. 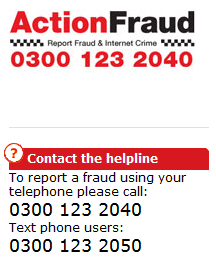 If you'd like to report a scam directly to Action Fraud, head to their reporting centre here. Don't be fooled by what looks like an unbelievable bargain. Let your common sense and intuition guide you when choosing a good deal. If an item is advertised at an extremely low price – it may be damaged, stolen or non-existent. If you suspect a listing is fraudulent or of an illicit/ explicit nature, please tell us so we can take it down. You can report it by using the "report it here now" link at the bottom of each ad listing. Arrange to meet the seller, accompanied by someone, in a local public place to ensure the item meets your expectations before exchanging payments. We don't recommend paying for an item you haven't seen, however if you decide to go down this route, ensure you use a secure payment method such as PayPal. Vivastreet does not act as a payment or transactions intermediary. It's never wise to carry large sums of money around with you, even less so when strangers know about it. Once you've inspected the item and are happy with it, head to your nearest bank and pull out the cash or arrange to meet the seller somewhere safe to exchange payments. Keep a record of the emails and conversations you have with a buyer. Ensure you record as much detail as possible so you can easily track your progress. When purchasing a bike, we recommend you ensure its legitimacy by asking the seller to provide you with proof of purchase or the bike frame number. If the price of the bike is too good to be true, there's a chance it may have been stolen. Many event suppliers do not allow ticket buyers to resell original tickets to others under their terms and conditions. We recommend you always check the supplier's T&Cs on ticket re-sales to ensure you aren't turned away by security for not having the same name as shown on your ticket. Try to fill in the entire posting form so your ad contains as much detail as possible. Images instantly make your ad appealing and stand out. Uploading multiple good quality photos increases your chances of ad success. Photos show clarity and authenticity which is important for buyers. Include a detailed description of your item or service on the posting form, specifying clearly and accurately your offer. Being brief or illusive will lead to people treating your ad suspiciously. Do not include content that violates our terms and conditions. If in doubt, please check our terms and conditions before uploading your ad. Keep an eye on all responses to your ad – answering questions about your item or service as quickly as possible. Have additional images available in case a customer wishes to view additional photos and if you get asked the same question more than once, consider updating your ad description. Where possible, ensure you have as much documentation available to prove authenticity of ownership. As nice as your item for sale may be, Vivastreet will not get in touch with you directly (either through an email or telephone) to buy it. If however, you receive an email claiming it's from us, please ignore as it is a scam and notify your local customer services team. You may receive an email from an interested buyer asking you to call a premium rate telephone number, often starting with 0844, 0870 and 0871. Do not call – it is a scam to charge you money for a high-rate telephone call to a non-existent buyer. If you have experienced this, notify your local customer services team. Always wait for a buyer's payment to be made or to have cleared in your account before handing over your goods. If you're being paid in cash, make sure you check the notes are not counterfeit. Full information regarding counterfeit notes can be found on the Bank of England website. When posting an item, make sure you obtain proof of posting and postal insurance. If you are receiving money through PayPal, ensure you meet the requirements of its seller protection scheme. Meet the buyer face-to-face in a public place, accompanied by someone. This will allow them to inspect your offer before the exchange takes place. If the buyer is eliciting fraudulent or illegal behaviour, trust your gut instincts and don't proceed. Viewings should be done during the day only. Not only is this the safest option but ensures viewers a clear and accurate picture of the property. Neither buyers nor sellers should attend viewings alone – ensure someone is always with you. If you can't get anyone to accompany you, let someone know the time of the viewing and the address. Arrange to contact them at a designated time so that they know you are safe. Plan for what they should do if you fail to call at the appointed time. If for any reason you don't feel comfortable entering a home – make an excuse and leave immediately. It's important to assess the situation and trust your instincts. Do not be persuaded by formalities. It's important to be friendly but avoid getting too familiar in case it gives the wrong impression. Be confident, controlled and professional in your approach – whether you are a buyer, looking to rent or a seller. Do not make any payments until you receive a formal written contract which has been signed and fully agreed by all parties. Some fraudsters ask for payments even before a viewing takes place – do not be deceived by their promises of a property/ rental agreement that sounds too good to be true – it usually is! You may receive an email from an interested buyer asking you to call a premium rate telephone number, often starting with 0844, 0870 and 0871. Do not call – it may be a scam to charge you money for a high-rate telephone call. Whether you're a tenant or a landlord, it's important to meet the other party before agreeing to a rental contract. This will give you the chance to ask important questions for your personal safety and judge the legitimacy of their offer. Warning signs should be alerted when a landlord tells you they can't meet you as they are abroad a lot – this may be a scam. We at Vivastreet love pets! We welcome the minimum standards announced by Pets Advertising Advisory Group (PAAG) and want all our members to respect these rules. Don't we all want these lovely pets to find caring and loving homes. Your ad must include a recent photo of the animal in question. Any ad without photos in this category will be disabled. You must specify the current age (in weeks, months and years) of the animal you are advertising. No pet should be advertised before it is weaned and no longer dependent on its parents. We do not allow cats to be sold within 9 weeks of being born. We do not allow dogs or any other mammals to be sold within 8 weeks of being born. Non mammals may be sold once they are capable of feeding themselves. (if you are in any doubt, please consult a local vet or the RSPCA on any advice on this). Please label clearly on each ad whether it is a private sale, commercial sale or from a rescue/rehoming centre. We have a dedicated category for Pets Adoption/Rehoming so please ensure you post in the right category. We do not accept ads for live vertebrate animals as food. We do not accept ads of pregnant animals for sale. Stud animals, animals in season or animals 'for rent' or 'loan' are not allowed in the pet section. We do not accept adverts for pets to be swapped with other pets, services or goods. We do not accept ads for sale of Monkeys and Meerkats. We do not accept advertisements for dogs with docked tails born after April 2007, with the exception of working breeds as defined in the Animal Welfare Act 2006. Any docked working breeds must state that a vets certificate is available to verify the docking was done legally. This restriction includes animals born outside England and Wales. Ads that contain species scheduled by the Dangerous Wild Animals Act are prohibited by International law, and as such will be deleted by our moderators. Live vertebrates are strictly prohibited to be delivered through the postal system, both nationally and internationally. All vendors should state the country of residence from which the animal is being sold. All commercial vendors need to provide Local Authority licence information when submitting an advertisement. -	For more information, please refer to: https://paag.org.uk/standards . For expert advice, visit the RSPCA or head to your local pet rescue centre if you're unable to find what you're looking for online. Always remember a pet is for life! Don't be fooled by what looks like an unbelievable bargain. Let your common sense and instincts guide you when choosing your vehicle. If it has been advertised at an extremely low price, significantly lower than market value – it may be severely damaged, stolen or non-existent. It's important to meet the seller, drive and inspect the vehicle thoroughly before agreeing to a sale – ideally during the day so you can spot any damage clearly. Do not go alone but if this is unavoidable tell someone where you're going, include your viewing time and seller's address. It pays to have an HPI check when purchasing a second hand vehicle. This provides private buyers, dealers, finance houses, and the insurance industry with access to information on all UK registered vehicles. It will help you determine whether a vehicle has been clocked, stolen or is a repaired insurance write off and ensure that it is legal and will belong to the people who buy them. Check the seller's address and vehicle identification numbers are the same as the ones listed on the registration documents. Check its service history and MOT certificates – original copies with watermarks not photocopies. It's important to do this before agreeing to a sale. Click Here to see the government's guidelines on carrying out MOT and history checks. Some fraudsters ask for a payment to be made before the delivery of the vehicle. Refrain from making any purchases related to transportation costs until you've legitimately received your vehicle. We recommend paying for the vehicle when you collect it from the seller. Do not use a money transfer service as it's the fraudster's preferred method of acquiring the money illegally. You may receive an email from an interested buyer asking you to call a premium rate telephone number, often starting with 0844, 0870 and 0871. Do not call – it is a scam to charge you money for a high-rate telephone call to a non-existent buyer. It's important to check that a buyer has a valid driving license and insurance cover before they test drive the vehicle. Ensure you accompany them on the test drive to avoid theft or unnecessary damage to the vehicle. Online bank transfers may be the safest way to receive money as you avoid handling large amounts of cash and problems associated with forged, cancelled or stolen cheques. Cash is also a good method of payment. Ask for the cash to be handed to you at your local bank, where forgeries can be checked and cash can be paid in to your account immediately. If this is not possible however head to the Bank of England website where you can find out more info about counterfeit banknotes. Conduct a thorough search on the company or organisation advertising the job vacancy. Not only will you gain a good insight about the organisation which will help in an interview but also the legitimacy of the role. Beware of any employer offering you a job without having met you face-to-face first. Skype calls are helpful if the role requires remote working. Wait until you have formally accepted the role and started working at the organisation to disclose your bank account and all other person details. Reputable companies will never ask for these details prior to you joining. It is very rare that a legitimate organisation will need you to make any form of payment before starting your role. If however you are being asked to make a payment for either training or starter kits for example, then take caution as this may be a scam. You may receive an email from an interested party asking you to call them back using a premium rate telephone number, often starting with 0844, 0870 and 0871. Do not call – it is a scam to charge you money for a high-rate telephone call to a non-existent job-seeker/ employer. If you would like to report a scam on Vivastreet or have issues with your ad, please do not hesitate to get in touch. Our friendly customer services team is on stand-by to answer your questions. Alternatively you can send us a message by filling out the form here. Please include your telephone number in your message so we can call you back. If you would like to report a scam, please head directly to Action Fraud's website here. In doing so, you are giving anti-fraud agencies vital information to protect you and others from being victims of online fraud. For more information about Vivastreet, head to our Corporate Website. Vivastreet has teamed up with Action Fraud, the UK's national online fraud reporting centre, to ensure you the safest possible experience when using Vivastreet. If you would like to report any suspicious ads or a person who has acted illegally on Vivastreet, please contact your local Vivastreet customer services team here. Please ensure you have the Ad ID number of the suspected scam. If you have been the victim of a scam or know of a fraudster, please head directly to Action Fraud's website here. In doing so, you are giving anti-fraud agencies vital information to protect you and others from being victims of online fraud. Action Fraud works closely with the National Fraud Intelligence Bureau (NFIB), which is run by the City of London Police. With the help of Action Fraud, Vivastreet is increasing the chances of bringing online fraudsters to justice. To report a fraud, Action Fraud's online fraud reporting form is available 24 hours every day. You can also get advice about fraud by calling: 0300 123 2040 (textphone 0300 123 2050). For general enquiries, you can email: information.enquiries@actionfraud.cjsm.net. Do not report fraud to this email address. Set up by the National Fraud Authority in 2009, Action Fraud handles reports on all types of fraud, including identity theft, credit card and consumer fraud. To date, Action Fraud has received over 91,000 calls and more than 330,000 unique visitors to its website since October 2009 and these figures are set to increase considerably with new developments that are being made to the service. Why can't I email a user directly? It is the right of every Vivastreet member to remain anonymous. To prevent spam we have developed anonymous email systems protecting both buyers and sellers, from people stealing their email addresses and spamming their inboxes. An anonymous email address is created for each Vivastreet ad (eg. 123456@vivastreet.com). When you send an email to one of these anonymous email addresses, it goes through our servers before being redirected to the true email address. It's as simple as that! Our secure response system will generate an anonymous email address for buyers when replying to an ad. What if an ad doesn't include a phone number? Sellers are encouraged but not forced to provide a phone number. It is the right of every Vivastreet member to remain anonymous. The best way to get in touch is through our secure email system. I've received an email from Vivastreet offering payment and protection services – is this legitimate? No! Please consider these emails as fake; they are known as 'spoof' or 'phishing' emails. Vivastreet doesn't offer any form of payment scheme or protection. If you receive an email alleging to be from Vivastreet and you are unsure of its legitimacy please contact us immediately. What should I look for to make sure I can trust a seller? Read the ad carefully and trust your instincts. If it reads well, is full of detail and description, includes photos and contact details then it is most likely legitimate. If the ad is vague, confusing, lacks an image or incorporates a professional/ website looking photo and if in general the offer sounds too good to be true, it may well be a scam. Remember, you can always contact the user through our anonymous email system so ask questions until you feel comfortable. You have the control so if you aren't sure then don't contact them again. How does Vivastreet protect me from getting scammed? We have built-in security filters that operate behind the scenes to identify and quarantine suspicious ads and users. We work with Action Fraud to prevent scammers and fraudsters from operating and to bring them to justice. However, we need your help too, which is why it is vital that you report any fraudulent ads and behaviour on Vivastreet. The more you tell us the more we can help. What should I watch for regarding scams? The best way to protect yourself is by asking questions, using common sense and learning as much as possible through the information available on our Safety Centre. Ads with incomplete information, missing photos, lots of typos could indicate suspect behaviour. When should I report an ad? Anytime you suspect an ad of being a scam, spam or breaking our terms and conditions then please report it. It's always better to be safe than sorry! We appreciate that some ads reported may be perfectly fine but would rather encourage our users to act if in doubt. Removing scams and catching those responsible for them is very important to Vivastreet. To prevent abuse, each user is entitled to report a maximum of two ads a day. How do I report an ad? Under the ad description box you will find a flag icon with the link 'Think this ad is a scam? Report it here now.' Click on this link and select the reason you are reporting the ad from the drop down menu. Please provide further information by entering your comments in the 'Message' box. What happens to reported ads? If we consider the advert to be a scam or is reported by several users, it is removed immediately from the site and reviewed by our moderation system. If however, we consider the advert to be genuine but find it contains some minor mistakes we will rectify the error and inform the advertiser. Vivastreet always has the final say on whether an ad is modified or removed. The advertiser can modify their advert at any time. However, once it is deleted access to the advert is removed. I've received an email asking me to change my password. I didn't request this, so why have I got it? If you did not request a new password, someone may have been trying to access your account without your permission. As long as you do not click the link contained in this email, no action will be taken and your account will remain secure. Someone has posted an ad on Vivastreet with my details, and I'm getting phone calls and emails, what do I do? It may be the case someone accidentally typed a phone number or email address wrongly when posting the ad. If you find your details on an ad you haven't posted, report the ad to us and we'll remove it immediately. I've received a suspicious response to my ad. What should I do? If in doubt don't proceed any further with someone who seems suspicious. If you'd like our advice, contact us so we can take a look and take appropriate actions, if necessary.